What exactly is a Clerk House? There are several ways in which the various lines of A.’.A.’. operating today differ. Clerk Houses, which are found in branches of Grady’s lineage, are one of the more distinguishable differences – and for this reason I am often asked, “Just what is a Clerk House?” – Though not part of the traditional A.’.A.’. system, Clerk Houses have evolved to serve a purpose within Grady’s line. However I should point out that not all members of Grady’s line go on to form Clerk Houses nor do most Clerk Houses choose to become public. 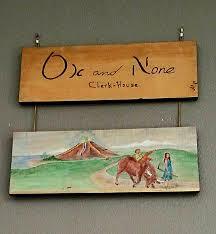 Traditionally, a “clerk house” is a store front or public face of a temple, an abbey, or an esoteric school. It is the administrative center of the operations of the school with the outside world. This is the meaning of the term since the middle ages across different spiritual traditions. From this Clerk-House, the spiritual school and abbey would be coordinating and administering both the dealings with the community and the teaching curriculum for the spiritual aspirants training at the school. The external function of this Clerk-House would be to administer both the business dealings with the community that would allow the school to survive and operate, and the actions performed to serve the outside community. So, it would be in this Clerk-House that all the accounting, inventory, paperwork, and student documents would be kept. Crowley often thought of the Kaaba in the religious context of Islam. The word “Kaaba” means “cube”, and it is the center stone around which the temple is built. Crowley wanted Thelemites to think of his house by Loch Ness, Boleskine, their religion’s Kaaba. He wanted Boleskine to be to Thelemites as Mecca is to Islam. However, initiates of the A.’.A.’. understand that vertical initiatory work is internal. In this light, the verse above is interpreted in the context of the first main task of the Order: to raise your kundalini and consciousness to the center of your Ruach, your mind, and from there enter into conscious communication with the Star, which is your true Self and whose orbit is your Will. It is, therefore, in the Lover’s grade that we attempt to balance the forces and powers of the Ruach, reconciling all opposites and putting the ego under control, in order to establish a firm connection with our true Self, and from there engage in conscious communication with our Higher Self of Genius. There, under that guidance, we then proceed to next phase of the Great Work which is the manifestation of your pure will in your life. In this initiatory blue print, to “Establish at thy Kaaba a Clerk-House”, means to set up an administrative center, a store front, at the center of your sacred cube. This sets the Clerk-House for the Adept with a dual function, as everything in the Ruach is subject to this duality: one inner, and one outer. The administrative function of the Clerk-House in the inner sense has to do with the ordering, balancing, and administration of the different parts of the Ruach. For the Adept, this means the reconciliation of all opposites and the mastery of all aspects of the mind, constantly endeavoring to bring all the elements of the lower and higher self to a state of balance and under the direction of the center, the Sun in Tiphareth, the True Self. This is the first part of the work of an Adept. It is secret and internal. This is “putting your house in order”, as Gurdjieff put it. With the house in order, the Master of the House comes. This is when we attempt to contact the Holy Guardian Angel in a conscious manner, and then establish the methods and conditions for such a communication to continue, acquiring a trusting and reliable source of teachings, guidance, and communion with the most sacred. This is why, in the Lover’s degree, and Adept who has made this contact no longer needs an external teacher, since she has already established a connection to the true Teacher, the real Guru who is a messenger of the sempiternal A.’.A.’. above the Abyss. From then on, your guidance is internal, and from there you derive your teachings, your gnosis, and your magick. The second part of the task of an Adept is to establish this Clerk-House in the outer, in the world. This is done under the guidance of the Holy Guardian Angel. If the first part of the task was about finding the laws of your Star and entering into conscious contact with it, the second part is about manifesting those laws in your sphere of influence, in your world. This is part of the meaning behind “thy Kingdom come, thy will be done on earth as it is in heaven.” In this phase of the Adept’s work, the task is to manifest the Clerk-House in the world. Each Clerk-House will be different, since each one is a manifestation of the innermost will of the Adept. This part of the task can take many years, or even a life time. The Ox and None Clerk-House was officially established five years ago, and continues to orbit around the Star which gives its Light, Life, Love, and Liberty from the inner to the outer. As an outer expression of its Kaaba, the Ox and None Clerk-House administers and operates the training of its students, working as an abbey or esoteric school traditionally represented by a beehive. This image illustrates the manner of work and service taught to every student. We research and teach through different traditions from around the world, and many of our students are inheritors and initiates of different traditions, each one contributing to the understanding, the practices, and the technologies employed in our Clerk-House. To sustain the efforts of the School, we produce works of art, books, street and stage performances, car washes, seminars and workshops. To service the community, we bring to the community, free of charge, training in arts and craft, the sacred art of The Telling, free weekly lectures and teachings, sweat lodges and vision quests, dream circles, healing, cine forums, and readings for the dying. All of these are given as an offering to everyone. Other ways of service are in the planning stage. The training itself is also free, but the student body is at maximum capacity at this time. The training is very engaging, committed, and exacting. At this point, we cannot accept new applicants, but everyone is welcome to participate in our weekly lectures, cine forums, and all the other community events we offer. If you live far from Riverside, our lectures and cine forums are broadcasted live on LiveStream, in the Koyote The Blind channel. This is a very dynamic community of practitioners and students. It won’t be long until other students will open their own clerk houses and thus open the doors of the teaching to a wider circle, each one attracting very different people because everyone is learning to connect with their own Star and evolve their own life into a unique source of service to humanity. Much has been accomplished in these first five years of the Clerk House, and in the 11 years of service of the School as the Xicoco Shamanic Arts. Tonight, we drink and celebrate for all my relations, and for the benefit of All Beings Everywhere!